Are you interested in learning about foundation grants for writers? There are a number of foundation grants for writers available, each of which has different requirements. Some are designed to provide financial assistance for unpublished writers, while others are intended to enable those who have already published at least one work to devote the time and energy they need to create additional pieces. If you're interested in applying for one or more of the available foundation grants for writers, you'll need to spend some time looking for programs that match your qualifications and needs. If you're serious about identifying potential sources of grant funding, consider becoming a member of The Foundation Center. Membership is inexpensive and provides an opportunity to search the organization's extensive database of foundations that fund grants for individuals. The Christopher Isherwood Foundation funds several grants for published writers. To be eligible for this award, individuals must have published at least one work of fiction. The publication can be a short story collection or a novel. Each grant award is for $4,000 and is made with the intention of allowing talented writers to set aside time for creating new works for publication. Grants are awarded on a competitive basis. Interested writers can find application guidelines on the foundation's website. The Maine Community Foundation administers the Martin Dibner Fellowship for Maine Writers. This award provides grants ranging from $500 to $1,000 to new writers. The program is designed for authors who show promise yet have not yet published a book. Funds are intended to help recipients pay for workshops that can help them refine their writing skills, but in some circumstances may be used for financial support for the writer who is in the process of completing a writing project. Awards are rotated between fiction writers (even years) and poets (odd years). The Lannan Foundation provides funding for a variety of literary programs. Each year, the foundation provides a number of literary fellowships and awards. These awards provide financial support to writers with a track record of making significant literary contributions and who have the potential to continue producing distinguished works. Individual writers cannot apply for this program, but rather must be nominated by an anonymous network of literary professionals. The final selection of grantees is made by the literary committee of the Lannan Foundation. 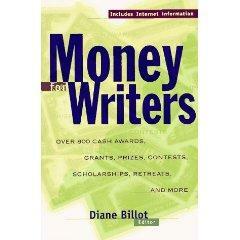 The process of applying for a writer's grant is no different from applying for any other type of financial support. Keep in mind that you are likely to have quite a bit of competition for each award you request. Don't limit your search for funding to a single grant program. Instead, look for multiple funding opportunities. The more grant programs you apply for, the greater your chances of receiving funding to support your work as a writer. Once you've identified one or more grant programs that seem to be a good fit for you, review the criteria carefully to be certain you qualify to apply. Once you determine this to be the case, you can proceed with requesting funding. Follow the application procedures precisely, making sure to answer each question clearly and concisely. Submit all requested supporting documentation. Do not deviate from the specified format and ensure that your application is submitted prior to the deadline. Keep in mind that requesting a grant does not guarantee that you will receive an award. While foundation grants for writers are an excellent way for authors to get the funding they need to devote time and energy to their writing, it is still possible to cultivate a successful writing career even if you are not able to secure such an award. Stay focused on your goal of becoming a successful writer and continue to make forward progress toward that end regardless of the outcomes of your grant seeking efforts.